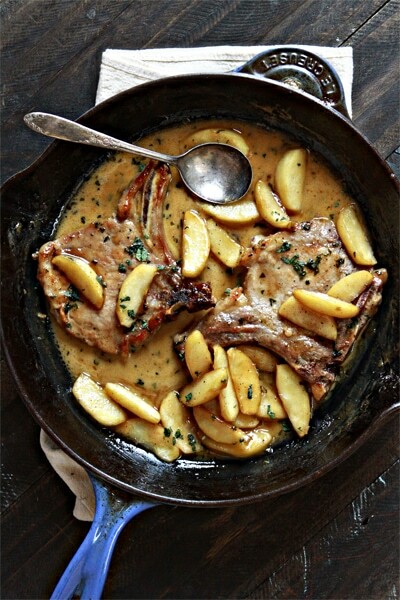 We found this recipe at Good Life Eats that uses apples in a sweet and savory pork chop recipe. Using 8 trays of Dippin’ Stix Sweet Gala Apples & Caramel, you could substitute out the recipe’s apples, butter & brown sugar. As fall is around corner and warm, savory meals abound, let us know if you try this recipe & how you like it! In a large sauté pan or cast iron skillet, melt the Sauté Express® Sauté Starter over medium heat until it begins to bubble. Pat the pork chops dry on both sides. Add the meat and cook for 3–5 minutes, or until browned. Turn and cook the other side until browned and the pork is cooked through (minimum internal temperature of 145 degrees F). While cooking, brush some of the Sauté Express® Sauté Starter on the side of the pork facing up. In another skillet melt the butter over medium heat. Add the sugar to the butter and cook for 1 minute, or until it begins to melt. Add the apples and sauté over medium heat until the apples are browned and tender. This should take about 10–15 minutes. In the pan with the pork chops, add the apple cider and cook over medium heat until the liquid is reduced by about half. Add the cream, bring to a boil and allow it to bubble for a few minutes until the sauce is slightly thickened. Sprinkle with fresh sage and season with salt and pepper if desired. If serving immediately, spoon the caramelized apples on top of the pork in the pan. Alternatively, you can pass the apples separately at the table and portion them out directly on the dinner plates.